…and all through the house, there were many projects to do, for me and my spouse. That’s right. Tomorrow we close on both houses and then we move everything out of the old one on Friday. It will be a whirlwind of papers and signatures and cleaning and packing and more. It’s bittersweet. While I’m SUPER excited to be in our new, bigger beautiful house, I’m also a bit sad to leave this one. I didn’t think I would be, given the old appliances, cramped hallways and never ending items to fix. But this is the place that CJ and I first called home. It was our first place that we got together. The one where we came to as husband and wife. The yard where we first chased Samson. The sanctuary where we brought home our new little baby. We’ve had a lot of great moments here and a lot of sad ones too. Though this was never meant to be our forever house, it will forever hold a place in our hearts. Tonight is Isabella’s last here. 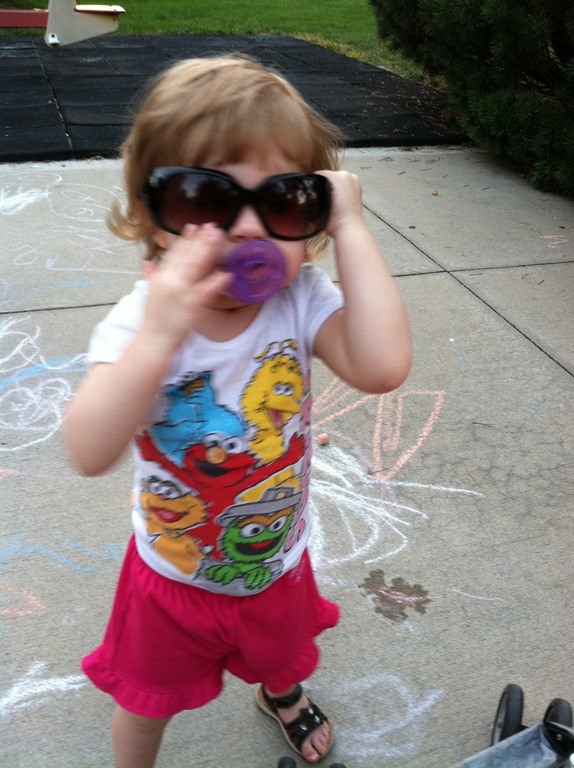 Tomorrow morning she’s off to spend the next 2 days and 1 night with her boyfriend Owen (in separate cribs of course). Our dear friends have offered to take her so that CJ and I can focus on getting both houses in order. We’ve talked a lot about moving and she loves the new house. But of course she doesn’t fully understand it all. Tomorrow when she leaves, it’ll be for good. 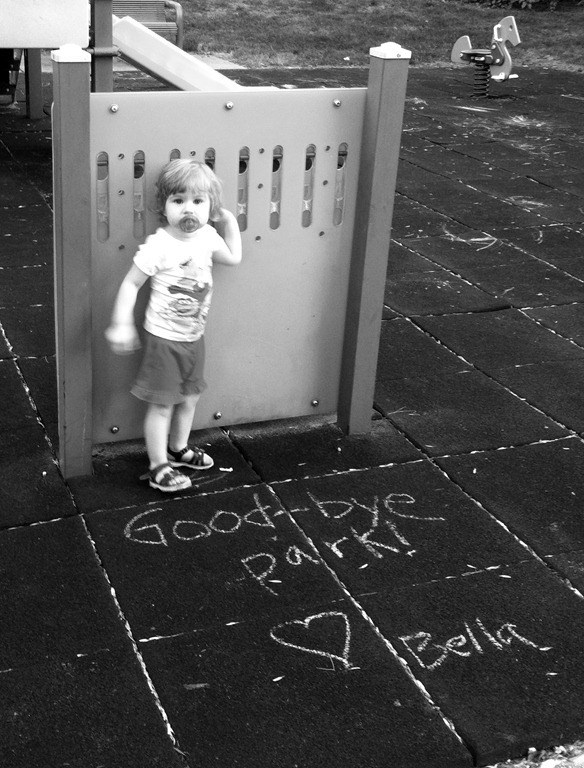 So, tonight we walked to her favorite park down the block. We went there almost every night of the Spring and Summer. I thought she’d like to say good-bye. 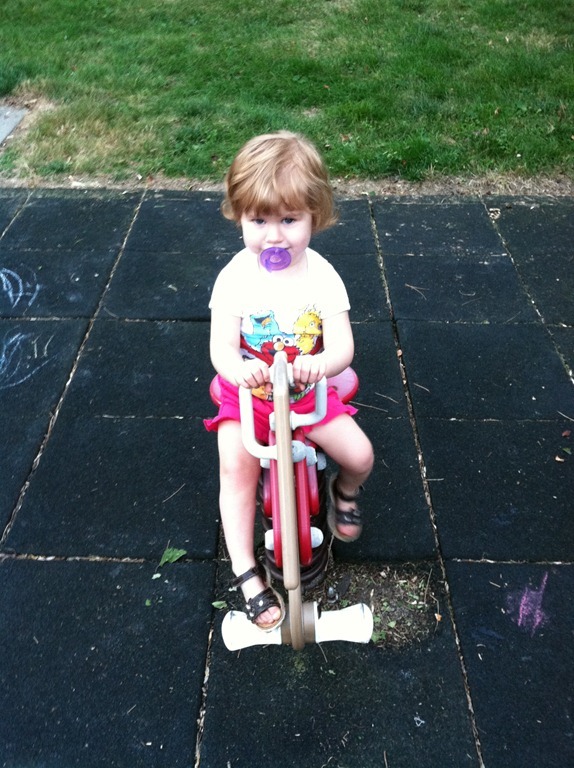 She even rode on the rocking horse – a ride that she’s always been afraid of. How appropriate that she finally decide to tackle it on her last night here. 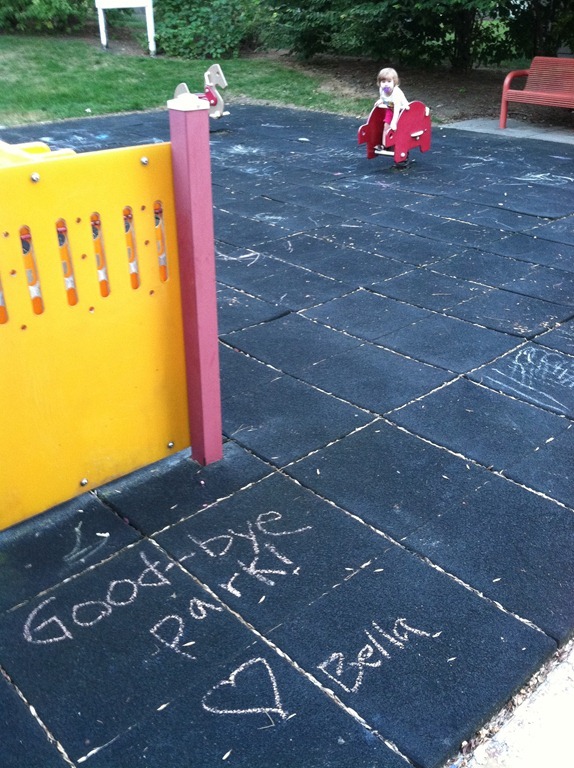 We even left a little good-bye note to the park. This will be my last post for a while. I’ll be too busy with moving stuff to blog – though I may post a pic or 2. The next time I sit down to write, it’ll be from my new house! Yippee! !